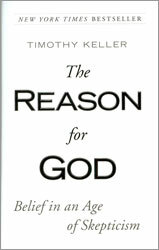 In the New York Times bestselling The Reason for God, the founder pastor of Redeemer Presbyterian Church in New York City, Timothy Keller, addresses the frequent doubts that skeptics, and even ardent believers, have about religion. Using literature, philosophy, real-life conversations, and potent reasoning, Keller explains how the belief in a Christian God is, in fact, a sound and rational one. To true believers he offers a solid platform on which to stand their ground against the backlash to religion created by the Age of Skepticism. And to skeptics, atheists, and agnostics, he provides a challenging argument for pursuing the reason for God. Our UBC Navigators students thoroughly enjoyed engaging this book and the style of writing is thoughtful while at the same time digestible. A good resource to get into the hands of those with lots of serious doubts and questions but also for those who need to be equipped to better understand the reasonability of God. Timothy Keller gives excellent answers to tough questoins. When you read a book like this you can easily see why it is a New York Times best seller.